The Binsky Blade Bait by Fish Sense Lures. The key to this type of bait is to imitate an injured or dying baitfish. The Binsky is the newest and brightest star on the blade bait market. It has a realistic shad design and an unmatched hard vibration that cannot be ignored. Most anglers use these baits in deep water with a vertical presentation, but fishing them is shallow water or near the surface can also work well. The Binsky – an all season lure. While the Binsky can be used all year round, it is most effective from fall thru winter and early spring. When water temperatures plummet gamefish school up in tighter groups in deeper water. They also seem to travel less making them more reliable and easier to find trip after trip. The Binsky is most effective in cold water it can be just as productive in the heat of summer. 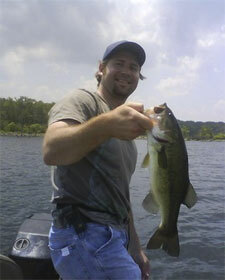 Game fish will do the same as in winter when water temps get increasingly warm in the summer. The fish will migrate to offshore structures and school up, often following schools of baitfish. Most strikes will be subtle, where the lure will stop falling or the vibration of the Binsky will just disappear. Be Ready, some times the fish will practically jerk the rod out of your hand. To much slack in the line will make it harder to detect a strike. Ledges, bluffs, channel breaks, humps and points. submerged timber, stumps, brush piles, grass, rocks, gravel etc. Remember to mix it up a little. You can double pump the Binsky by using a smaller range of motion with shorter hops. Sometimes you may have to slow down your retrieve and take more time between hops. there are times when you might even need to allow the metal vibrating lure to lay on the bottom and just twitch it slightly. You can also fish it using a steady retrieve. The Binsky has a unique vibration capable of provoking any near by predators to strike. 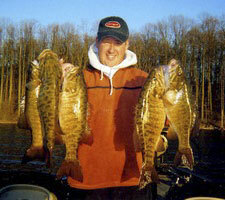 During real cold periods remember the fish will have a very small strike zone.